Merle Wood & Associates is pleased to offer the GABRIELA G yacht for sale. Launched in 2001 with a refit complete in 2010, she was constructed by yacht builder Overmarine-Mangusta. Three staterooms comfortably accommodate 6 guests on the lower deck, making it the ideal family yacht. She has only been used as a day boat by her owners, and has been immaculately maintained by the same captain for 12 years. With a beam of 18’ (5.6m) and a draft of 4’ (1.4m), she is serviced by 2 crew. 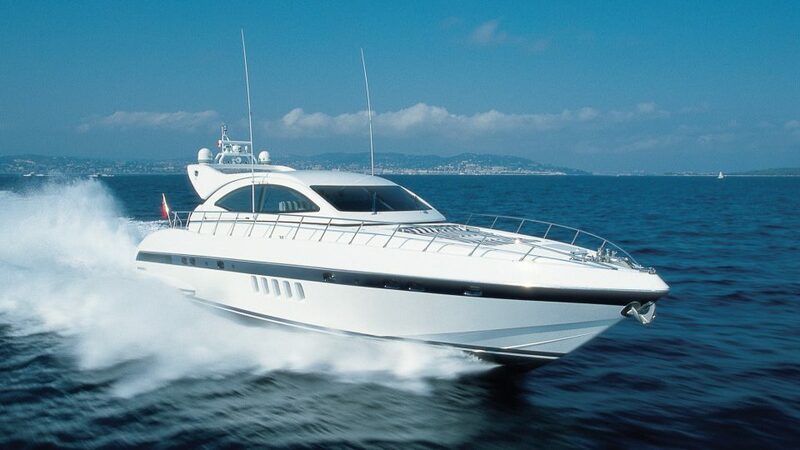 Merle Wood & Associates is proud to include the sleek GABRIELA G yacht for sale in our sales fleet. She represents a great opportunity to purchase a Mangusta with a US build spec. We are offering the GABRIELA G yacht for sale with an interior lined with light wood contrasted by deep brown leather furnishings. The salon boasts a U-shaped leather sectional faced by two small tables, and matching ottomans. A flat screen TV makes this room ideal for quiet cinema nights in, after a day spent swimming and enjoying the outdoors. Her exterior deck spaces offer al fresco dining that can either be open or closed, depending on the weather or needs of the guests. A modern, state-of-the-art bridge forward features Inmarsat, Furuno, Panasonic, Simrad, and Zenith navigation and communication systems, while a host of water toys on board include waverunners, dive gear, and water skis. Ready to sell, the GABRIELA G yacht for sale has original engine hours that are low; 2 MAN engines at 1,300hp each, plus a 5-blade propeller give her a maximum speed of 35 knots, while her cruising speed is 25 knots. Luxury Yacht Broker John Jacobi of Merle Wood & Associates, has over 15 years of experience in high-end luxury markets worldwide, and over a decade working for clients on luxury yachts for sale. He has traveled the globe to successfully build, buy, sell, and charter yachts for discerning clients worldwide. For additional information, read the full GABRIELA G yacht specs or view the GABRIELA G yacht price and details. For information about the GABRIELA G yacht for sale, or for expert knowledge from a qualified yacht broker, simply contact the luxury yacht brokerage firm of Merle Wood & Associates for assistance.